Deputy arrests intoxicated Rohnert Park driver on drugs, weapons charges. 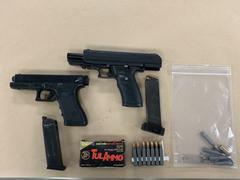 A Sonoma County Deputy Sheriff arrested an 18-year-old Rohnert Park woman for being under the influence of drugs and possession of an unregistered handgun that was found in her car. Last night at about 6:30 PM deputies responded to a call of a suspicious car in the 6500 block of Petaluma Hill Road. The caller stated the white Chevy Malibu had been parked there for several hours. A deputy found the car that was parked partially over the white edge line blocking traffic. The car was not running, it was in drive and a young woman was passed out in the driver’s seat. The deputy called for an ambulance thinking it was a medical emergency when he was unable to wake her. The deputy looked in her purse to find identification and found a replica pistol. Another deputy arrived and they were able to get the woman up and out of the car. She was identified as Carrie Cordova-Dalson and was determined by deputies to be heavily under the influence of drugs and said she parked her car like this because she ran out of gas. Deputies arrested Cordova-Dalson for being under the influence of drugs and when they searched her car they found a loaded .45 caliber semi-automatic pistol under the front passenger seat. Cordova-Dalson was booked into the County Jail on charges of unlawful possession of an unregistered concealed weapon in a vehicle and being under the influence of a controlled substance. She remains in custody on $30,000 bail.